The flickering lamps on every street corner fail to dispel the darkness that lurks in Arkham. In the quiet halls of Miskatonic University, academics strive to gain answers that were never meant to be known. The relics displayed in the Miskatonic Museum cannot be separated from their strange and bloody pasts. And in less dignified spheres, the corruption and violence of the O'Bannion and Sheldon gangs take their toll on the citizens who live in this mysterious Massachusetts town. 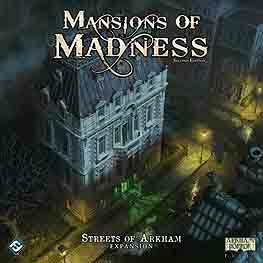 The Streets of Arkham expansion introduces iconic Arkham locations and the sinister secrets they conceal. Three new scenarios test the mettle of the investigators as they face off against visitors from beyond the stars, forces beyond reckoning, and violent criminals. To drive back evils both ancient and modern, investigators must unlock their full potential using reality-defying spells, powerful items, and strange elixirs. Whatever the cost, the city of Arkham must be saved. Requires Mansions of Madness Second Edition to play. Possibly one of my favorite cooperative games to date. The second edition now uses an app to determine which tiles, unique and common items to use for the scenario. The quality of the games pieces is second to none. The figures look fantastic painted. There is also a number of expansions that give you new scenarios and characters.